When the 2016 BMW 7 Series was unveiled, the Germans claimed that it arrived bringing no less than 25 innovations on board, 13 of which were a first for the entire auto industry. Among other features such as laser headlights with adaptive beams and gesture control, one of them was more interesting than the others, namely the Remote Parking function. With it, the Bavarians said that you could virtually park your 7er into a tight parking spot without even sitting behind the wheel. The entire process would be done via the new Display Key by simply pressing a button. While it did seem like it was too good to be true at first, the Germans proved it works over and over again, the latest video of this feature in action being posted below. This clip was shot with the help of the guys from NXP Semiconductors at NXP’s Investor Day 2016 in New York. 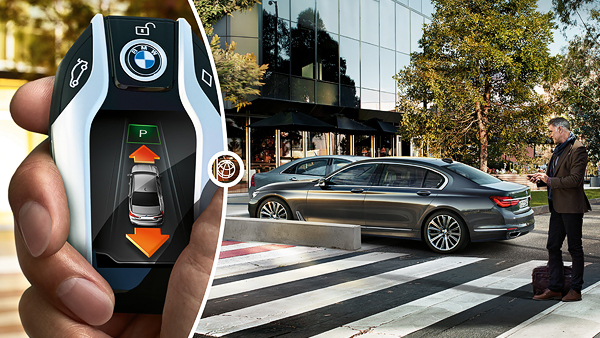 The Dutch company is the one behind the plethora of sensors planted inside the BMW 7 Series, including the ones used for the Remote Parking function. As you can see in the video below, they work by keeping the car safely within the limits of the parking spot you’ve chosen and also by identifying if the path is clear or any adjustments need to be made. Initially, this feature was deemed illegal in the US because federal law requires all cars to have a shift-interlock function. Intended to prevent vehicles rolling away unexpectedly, the law requires a car’s brake pedal to be depressed before its transmission can be shifted out of Park. Because the brake pedal doesn’t move when the 7 Series parking function is activated, BMW declined to offer the feature here at first. However, it seems like BMW and the NHTSA reached an agreement regarding how the law is interpreted in this regard, and Remote Parking may soon be offered to customers in the US.